New Jersey cosmetic dentist Dr. Harold Pollack is announcing the Smile Out Loud program for patient referrals. The program rewards patients with a $25 gift card for referring friends, family members, or colleagues to his cosmetic dentistry practice, Beautiful Smiles. Dr. Harold Pollack says regardless of whether he is performing preventative or family dentistry, teeth whitening or porcelain veneers in New Jersey, referrals are extremely important to him because they are a reflection of the positive experience he strives to create for each patient. Dr. Harold Pollack, a New Jersey cosmetic dentist and American Academy of Cosmetic Dentistry (AACD) member, is now offering a patient referral program called “Smile Out Loud,” designed to encourage patient communication and reward loyalty. Through the program, he hopes patients will exchange valuable information about procedure expectations and use first-hand experience to further enhance the patient education process. Whether patients are considering procedures in teeth whitening, professional cleaning, or dental implants, Dr. Pollack says it is important for individuals to trust and feel comfortable with their dentist. 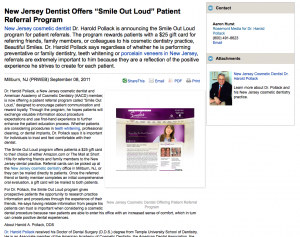 The Smile Out Loud program offers patients a $25 gift card to their choice of either Amazon.com or The Mall at Short Hills for referring friends and family members to the New Jersey dental practice. Referral cards can be picked up at the New Jersey cosmetic dentistry office in Millburn, NJ, or they can be mailed directly to patients. Once the referred friend or family member completes an initial comprehensive oral evaluation, a gift card will be mailed to both patients. For Dr. Pollack, the Smile Out Loud program gives prospective patients the opportunity to research practice information and procedures through the experience of their friends. He says having reliable information from people his patients can trust is important when considering a cosmetic dental procedure because new patients are able to enter his office with an increased sense of comfort, which in turn can create positive dental experiences. Dr. Harold Pollack received his Doctor of Dental Surgery (D.D.S.) degree from Temple University School of Dentistry. He is an Associate member of the American Academy of Cosmetic Dentistry, the American Dental Association, the New Jersey Dental Association, and many other dental societies. Dr. Pollack has been selected as one of the “Best Dentists in America”, one of New Jersey Monthly Magazine’s “Top Dentists”, and one “NJ’s Favorite Kids’ Docs 2010” in NJ Family Magazine. Located at 280 Millburn Avenue in Millburn, NJ, Beautiful Smiles by Dr. Harold Pollack can be reached at (973) 947-4331. Dr. Pollack and his practice can also be contacted online via their website beautifulsmilesnj.com or at facebook.com/drharoldpollack.